This year’s MACNA (Marine Conference of North America – Sept. 5-7, 2003) was a great success. It is always wonderful to hear new speakers and to visit with old friends from all over the world. If you haven’t been to a MACNA, I strongly suggest you sign up for the 2004 MACNA which will be held in Boston, MA. More details to come. I don’t know whether it’s the time of the year, the weather, or just meeting old friends at a MACNA that gets me to want to push the envelope. 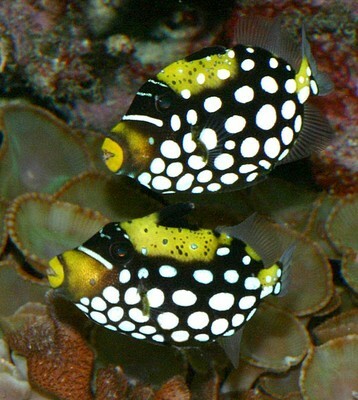 Whatever the reason or reasons, I decided to buy two small clown triggerfish ( Balistoides conspicillum ) to add to my 10-foot reef tank. As you can see from the pictures, they appear to be thriving. In time they will grow up, and then what. 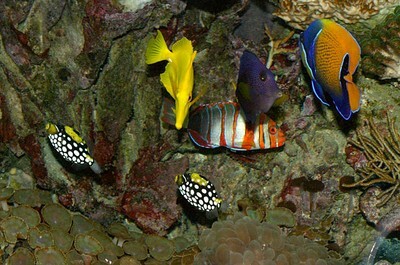 Of course, my fantasy is that they will mate and spawn, not destroy everything in my reef tank. 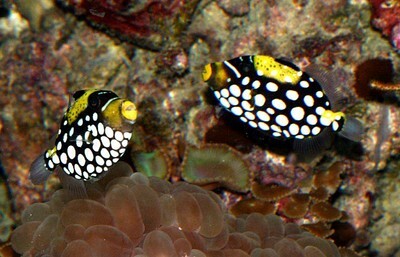 I do keep angelfish and tuskfish in my reef – how much more trouble can a pair of juvenile clown triggers be? You say, ‘but they grow up.’ As Greg Schiemer – one of our fish columnists — said with a smile on his face, “don’t worry, they’re easy to catch because they are such voracious feeders. Balistoides conspicillum in my reef tank.